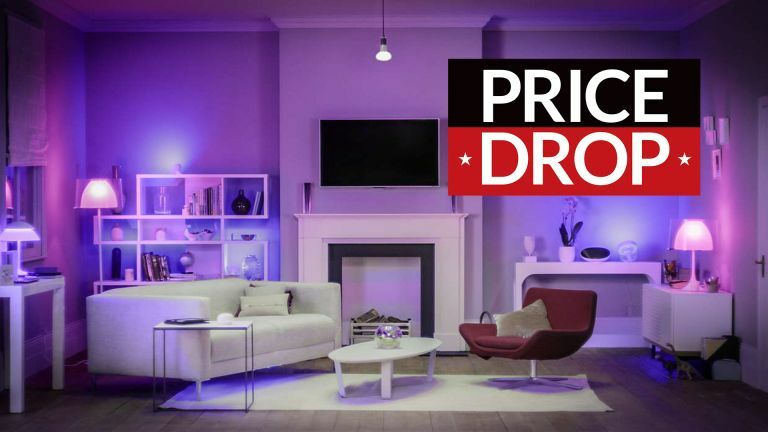 If you're thinking it's about time to light up your home with some smart lighting, then you're in luck because just over a week ago Amazon slashed the price on the Philips Hue White and Colour E27 starter kit and today it's just dropped the price again, so you can now save 25% on the sticker price. It's giving us Amazon Prime Day déjà vu. The kit consists of three E27 (screw-in) bulbs, the Philips Hue bridge and a remote dimmer switch. The bridge is the essential bit which enables all you to control your lights, whether that's via voice, the Philips Hue phone app or a dimmer switch. The bulbs are both white and colour. They offer millions of colours and 50,000 shades of white light, which should be enough for anyone. The dimmer switch means that you – or guests – can easily control the lights in the traditional way of pressing a switch on the wall. The dimmer is also held to the wall-mounted base plate magnetically so you can remove it and use it as a remote control from elsewhere in the house. It sounds like an unnecessary extra but it's actually nice to be able to press a button to switch the lights on first thing in the morning rather than having to sleepily murmur "OK, Google, turn the lights on" or fiddle with a phone through bleary eyes. We think that Philips makes the best smart bulbs, both because of their functionality and because it's easy to add more Hue items to the network at a later date. We have no idea how long the price will stay reduced from £169.99 to £189.08 before it goes back up, so if you want to get it at this price, you might want to hurry.